Talking Point - Where is Freiburg? "I live in Freiburg. This is my school." This section introduces Freiburg, a medieval cathedral city and university town in the south of Germany. Much of this pack's films are set here; Freiburg claims to be the "greenest", most environmentally-friendly city in Germany. 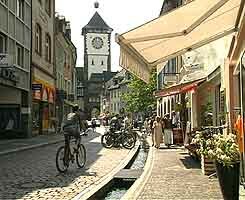 Pupils learn how to identify places that might be significant to children in a German town or in their home town. This is the first step towards being able to describe where you live, ask directions and give information about where places are. Talking Point: Where is Freiburg? This GoogleMap is centred on Freiburg Munster, the cathedral. Really useful additional information for teachers. As a cross-curricular project, develop ITC skills by making a guide to your community for German visitors, using the new language you learn in this section. One school took digital photos of places they decided German visitors might like to see, then recorded commentary - and even added video clips! They expanded their project as they learnd more in subsequent sections.